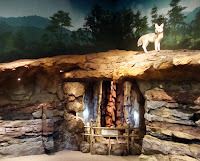 Walking into NatureQuest, the newest kids’ activities exhibition at the Fernbank Museum of Natural History immediately made me feel like I was in Willy Wonka & the Chocolate Factory. Where animals, live and not so live, play the role of the singing Oompa Loompas; the blue river with "splash" technology is the river of chocolate; and the activity stations' props are the garden of edible flowers. The only challenge was deciding what to explore first. NatureQuest takes youngsters on an adventure through land, water, and air...and spectacularly so. Immediately in front and to the left of the main entrance of NatureQuest is a coral reef…but you’re not looking at it from above, you find yourself actually inside it! 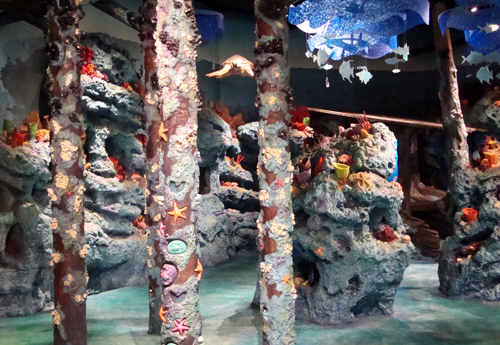 When you look up you see a Loggerhead Sea Turtle swimming through this magical ocean. Georgia Aquarium and Fernbank Science Center no longer have the display monopoly of this endangered species! Also above is a dock with a motorboat tied to it. The boat is aptly christened the S.S. Fernbank. Mobiles of blue sparkling waves and many species of fish, jelly fish too, dangling from them launch the imagination to wondering about the abundance of sea life. The barnacle-covered poles supporting the overhead dock are covered with (removable) crabs and starfish...part of the more than 50 interactive adventures ready for kids to engage in. 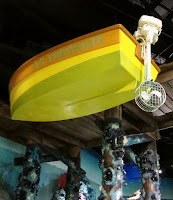 Nearby there’s another discovery station where kids can see what it might be like if they were piloting an underwater vessel, complete with images of sea life swimming in front of the forward viewing windows. 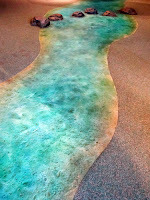 Flowing into the ocean is a river, shining bright blue, which runs practically the length of NatureQuest. But this is no ordinary river. This river has sections that splash and swirl under your feet. It’s a fascinating experience and one that will keep you walking on water for more than just to cross the river. This was the most fun technical feature in the exhibit, but I didn’t try them all so there may be other even more cool features. Along the river there are animal tracks to be discovered; a rock crossing; and woodland and river animals nearby to keep kids company during their playtime. 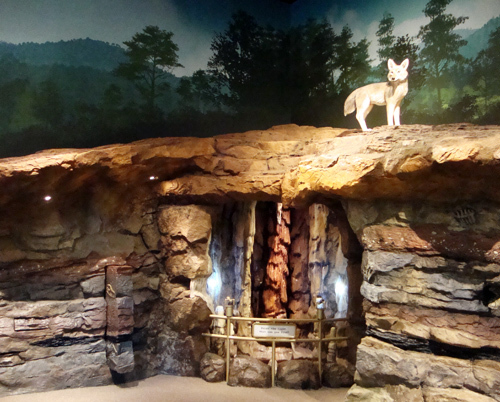 The River exhibit includes a Featured Resident (the Beaver when I was there) and invites explorers to find other river creatures. There are so many interactive and discovery stations in NatureQuest, I think a kid could stay here all day and still not play with them all. 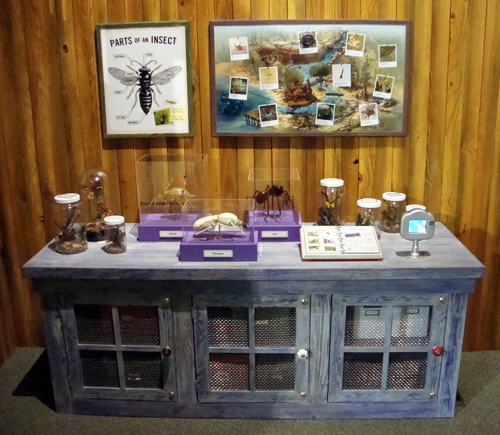 The insect station looked very interesting with its giant aphid, termite, and ant. The telescopes throughout, the spotlights, and the vistas everywhere in the exhibition lend to the already exciting game of discovery. 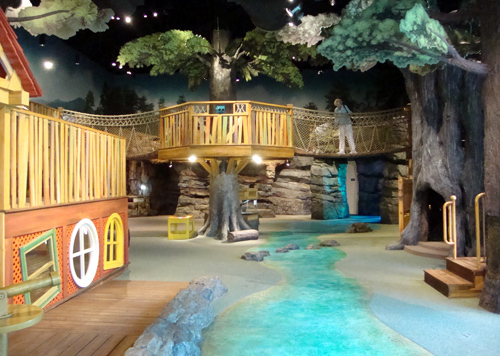 And their particular (pseudo) Tree House is a much nicer tree house than what I had as a kid (by a factor of about a bazillion), but part of what exhibitions like this are for is to encourage kids to imagine not only what’s in the world but what they can create in it…at least I hope so. 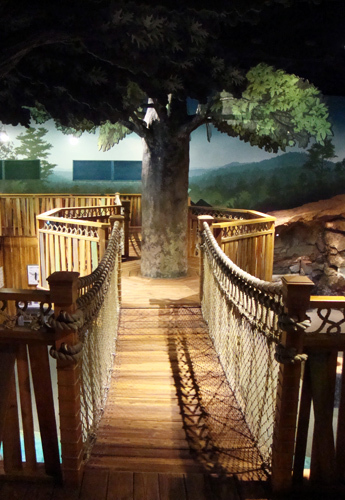 The Rope Bridge has to be my personal favorite part of the entire exhibition. It stretches across the NatureQuest gallery, wraps around both sides of a tree, and offers the best vista for the land of exploration. Unfortunately, I’m a “few years” beyond NatureQuest becoming a regular destination, but knowing that thousands of kids will enjoy it, which makes me equally as happy. To get to the Rope Bridge, you can climb steps and go around the Big Tree or…you can climb inside the Big Tree on a spiral rope ladder! 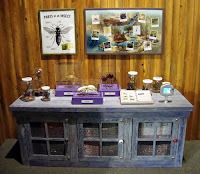 NatureQuest is world of wonderment, it’s “a revolutionary new children's exhibition that builds on the sophisticated learning style of modern children”…it’s a nature factory filled with the delicious treats of exploration and entertainment. Every kid will feel like they themselves had won a Golden Ticket. Will I return to continue the exploration of NatureQuest? Probably not on my own, but when the nieces and nephews are visiting, I’ll definitely take them. It’s any kid's dream destination!